The Pythons come to the Ziegfeld in October. Holy Grail fans, your quest is at an end! The entire Monty Python troupe is reuniting on October 15th at the Ziegfeld Theater for a special event presented by the IFC and BAFTA (the British Academy of Film and Television Arts). 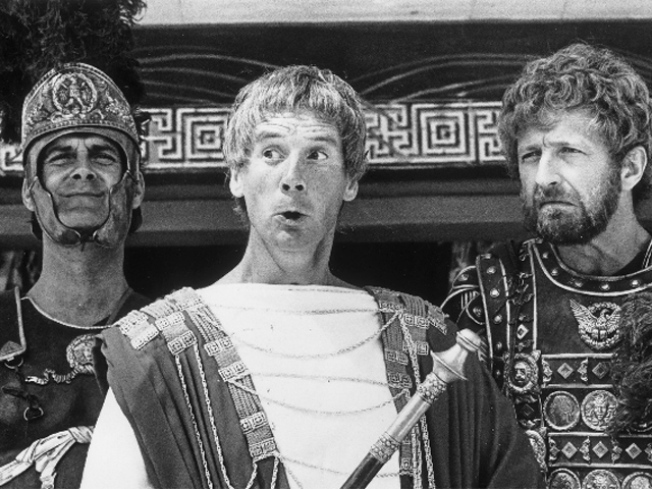 Yep, you heard right: The whole troupe, John Cleese, Terry Gilliam, Eric Idle, Terry Jones, Michael Palin and even Graham Chapman, who died in 1989. (Chapman has joined the Python crew posthumously before, appearing in the form of an urn said to contain his ashes, but for this landmark event, we’re gunning for a hologram!). The event will include a special screening of the new IFC original documentary "Monty Python: Almost the Truth (The Lawyer's Cut)" – crammed full of commentary from a veritable who’s who of funnymen, from Russell Brand to Eddie Izzard to Jimmy Fallon -- plus a Q&A with the cast and a lifetime achievement award-type thingy from BAFTA. According to BrooklynVegan, “ticket info for this event is scarce but word on the street is that SOME tickets will be available at www.ifc.com in mid-September.” And that's all we know. Frustrating, innit?